Your health professional will ask about the areas of concern to you and evaluate the condition of your joints and muscles. A diagnosis will be made and further testing may be requested including x-rays etc. not everybody need these x-rays and we do not routinely need them, its case by case. A treatment plan will be developed for you and the goal and time frames explained before commencement of treatment. On your first visit you will receive some relief care including treatment unless contraindicated. 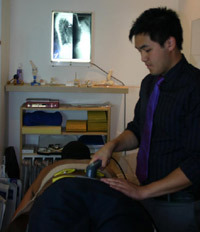 Treatment consists of stretches, physical therapy modalities, massage techniques, adjustments and mobilisation. We want to know how you responded to the first treatment and usually need to get you in within 72 hours on average. This is because our style of care is vigorous and you may be slightly sore post-initial treatment. The second treatment usually builds on the first and we monitor your responses accordingly by changing the intensity of therapy. Give our Osborne Park physiotherapy office a call to schedule an appointment today!